It's that time of year again: Elf time. 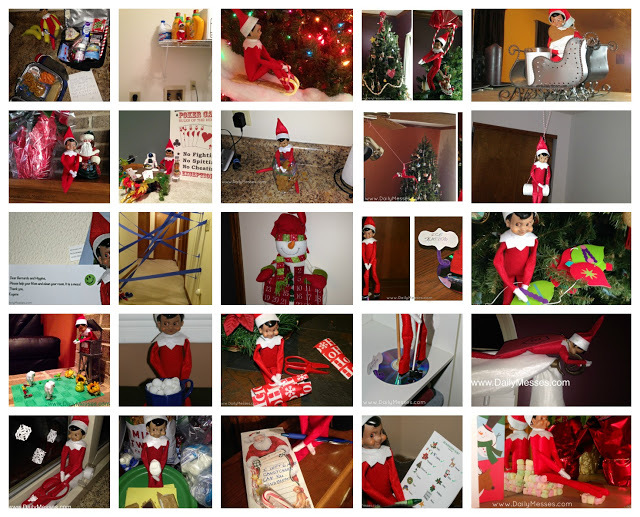 I am still coming up with this year's ideas for our elf Eugene. However, I do have some of his more exciting past adventures listed below. I'll update this post when I get new ones! Relaxing on a marshmallow chair. My most insane idea yet, as I stabbed my fingers multiple times with toothpicks. However, when I was done, Eugene did have a nice (yet small) chair and foot rest made of mini marshmallows. Super Hero E!. While he may just be pretending to fly on the curtain rod, he did have a cape. Making a garland for the tree. Zip Lining to the tree. Zombie Attack. Playing Plants VS Zombies. Making a S'more in the pantry. Treasure Hunt. Eugene likes to leave things for the boys when he goes home. One year it was a wrapped present, another year he left them a treasure hunt. Making a snowman. I stacked larger sized marshmallows to form the snowman. I used an edible marker to make the face and buttons, although melted chocolate would work well too. You could "glue" the marshmallows together with chocolate or hold together with a toothpick down the center. "Doctor Who" Elf vs. a Dalek. Minecraft Steve Elf with Diamond Helmet and Sword. Flying on the dinosaur that was hanging in Higgins' room. Using my Christmas Scavenger Hunt card. Leaving a note to clean their rooms. Elf sized donuts. Have the Elf eating these, but have another plate with note that these are to share. Originally, I made these for the leprechaun, but change the candy melts to a darker green, red, and white and they would work great for an Elf sized treat. Sick Note from the Elf. Writing a Story with the Elf.